Stars: James McAvoy, Michael Fassbender, Jennifer Lawrence, Oscar Isaac, Rose Byrne, Evan Peters, Sophie Turner, Tye Sheridan, Carolina Bartczak, Kodi Smit-McPhee, Ben Hardy, Alexandra Shipp, Berdj Garabedian, Olivia Munn, Hugh Jackman. A Messy Tangle of Apocalypse and Fatherhood. During the end credits ofX-Men: Days of Future Past (2014) Bryan Singer set the stage for X-Men: Apocalypse. Filmgoers who sat through the last frames of the film were introduced to the character of Apocalypse a mutant standing on a sand dune in ancient Egypt telekinetically constructing a massive pyramid with a crowd of worshipers at his feet and his four horsemen watching at a distance. In the opening scenes ofX-Men: Apocalypse this now aged mutant is shown transferring his accumulated knowledge, abilities, and his soul, into a new younger body. This is still all taking place around 5,500 years ago in Egypt where Apocalypse/En Sabah Nur (Berdj Garabedian) is being worshiped as a god. But not all the Egyptians worship him; a small group of soldiers are seeking to kill Apocalypse and destroy the pyramid in which this transfer to a new body is taking place. While they succeed in destroying the pyramid they otherwise fail. With the transfer complete, the newly minted Apocalypse (Oscar Isaac) is left trapped under the rubble until the early 1980s. This prologue feels and looks a lot like the film Stargate (1994) which spawned the TV showsStargate SG-1 (1997-2007), or the History Channel's Ancient Aliens (2009 - 2016) which presents for modern viewers the ideas found in Erich von Däniken's book "Chariots of the Gods" (1968). von Däniken's book suggests that the gods of humanities past were actually aliens misidentified as gods by primitive minds too dense to understand the truth of what they were seeing. Although powerful, Apocalypse isn't a von Däniken style alien rather he's described as "the first one," the first human to carry the mutant x-gene and in a way, by passing on his genetic information, he is like a father to the future generations of mutants including the heroes of the film who fight to stop his plans to destroy and recreate the earth. The central theme of X-Men: Apocalypse is fatherhood—a theme at the heart of the story’s three threads. 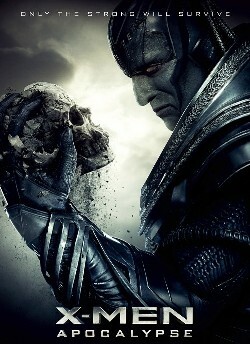 Apocalypse, who is referred to in the film as a false god, claims the place of father over the mutants and the rest of mankind presenting himself as god. Professor Charles Xavier (James McAvoy) and his School for Gifted Youngsters serves as an institutional form of fatherhood where people like Scott Summers/Cyclops (Tye Sheridan) and Jean Grey (Sophie Turner) along with other young mutants can find shelter and adoption into a family of like individuals. Lastly, the emotional centre of the film is the story of Erik Lehnsherr/Magneto (Michael Fassbender) who, following the events ofX-Men: First Class (2011), had attempted to live a simple life setting aside his powers of magnetism. Lehnsherr worked in a refinery and shared a happy life with his wife Magda (Carolina Bartczak) and young daughter Nina. This happy life however was doomed to fail and following the tragic loss of his new family Apocalypse exploits Magneto's grief making him one of his four horsemen along with Ororo Munroe/Storm (Alexandra Shipp), Angel (Ben Hardy) and Psylocke (Olivia Munn). Weaving through the movie is a glimmer of hope: Magneto's secret son, the scene-stealing Peter Maximoff/Quicksilver (Evan Peters), who wants to introduce himself to his father. Quicksilver then represents the promise of restored fatherhood and a possible redemption for the conflicted Magneto who believes fatherhood has been taken from him. Does the One True God of Scripture factor intoX-Men: Apocalypse? Following the film’s prologue, a visual sequence shows the progress of time running from ancient Egypt to 1983 America including an image of Jesus carrying His cross to Golgotha and His crucifixion. From time to time throughout the film the demonic looking Roman Catholic mutant Nightcrawler (Kodi Smit-McPhee) is shown praying to God and making religious exclamations. Professor Charles Xavier likewise makes references to God albeit in a more agnostic way. And in the wake of the death of his new family, Magneto, whose childhood family were Jewish victims of the WWII Holocaust under the Nazis, lashes out with his mutant powers and looks up into the heavens and calls out to God, "Is this what you want from me?" Like Job from the Bible Magneto questions his tragic circumstances pleading directly to God. What about the character of Apocalypse? What is his take on God? Apocalypse is not a believer in the God of Holy Scripture. In fact, he believes he is the source of the faith others confess saying of himself, "I've been called many things over many lifetimes: Ra, Krishna, Yahweh. I was there to spark and fan the flame of man's awakening, to spin the wheel of civilization." Apocalypse isn't the only character dismissive of God as confessed by Christians. CIA agent and non-mutant Moira Mactaggert (Rose Byrne) who acts as a sort of DaVinci Code-style Robert Langdon, provides her take on Apocalypse explaining to the X-Men how, "ever since the world found out about mutants there have been secret societies, who see them as some kind of second coming or sign of God. They believe that tens of thousands of years ago an ancient being was born, the world's first [mutant]." She further suggests that the Bible’s idea of the four horsemen of the Apocalypse (Revelation 6:1-4) came from this ancient villain and not from God. Mactaggert represents a more atheistic view of the situation. Compared to classic Western Judeo-Christianity X-Men: Apocalypseis a messy spiritual tangle, a reflection of our times. For some characters the God confessed by Christians is the God they confess, for others God is part of that Judeo-Christian capital imprinted on history. Still others see God as some distant concept. For Apocalypse God is insignificant because Apocalypse himself is God or at least serves in an utilitarian function as the god of this world. As measured by the Ten Commandments Apocalypse is the paramount breaker of the First Commandment, "You shall have no other gods," as he does not fear, trust and love the One True God above all things. The question lurking at the fringes of the film is one of trust. Where and in whom do the mutants put their trust in the face of apocalyptic disaster and/or personal tragedy? Do they put it in God the Father, in the false god Apocalypse who calls them his children, do they put it in Xavier and their adoptive X-Men family, or do they trust only in themselves as Magneto is tempted to do? As expected Apocalypse and his apocalyptic schemes are thwarted, the future is again saved, and the world is left seemingly unaware as to its saviors. Following the film’s final conflict, we hear a newscaster's colour commentary exclaiming that the world was saved, “By the grace of God,” and then another newscaster responds, “I think our prayers were answered.” Are these comments intended to be read as cynical irony or as genuine truth? Are the X-men intended to be seen as men and women acting as the avenging hand of God against a First-Commandment-breaking creature who has overstepped his predetermined limits? Have they been the “hook in Leviathans nose” (Job 41:1-2)? What, if anything, does Bryan Singer, the director, want people to leave the theatre thinking? This is a worthwhile question for viewers to contemplate. Is X-Men: Apocalypse worth seeing? If watching the world on the brink of total destruction over and over again has become tedious and exhausting, or if super hero movies in particular are starting to wear a bit thin then it may well be best to steer clear of this film. 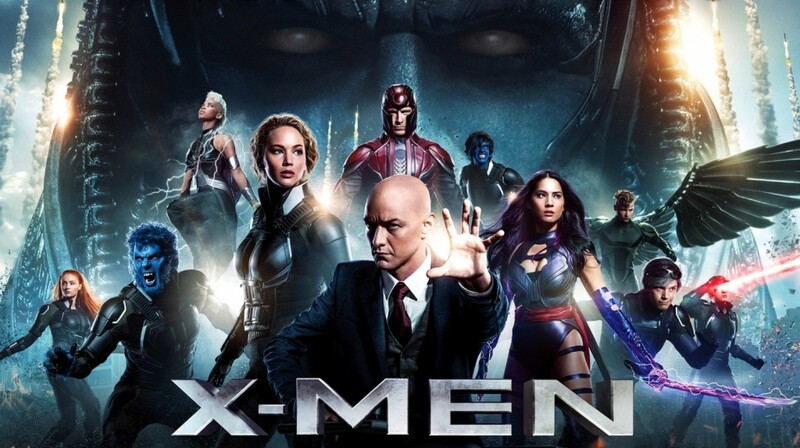 If however MARVEL’s X-Men franchise is a favourite along with its vast cast of characters then check it out. For long time fans it will be very engrossing. Is it as good or better than other recent super hero movies? For super hero fans there is a lot of fan service, including a cameo from the Wolverine (Hugh Jackman), but overall the film feels like it's collapsing under the weight of its ambitions to be epic. As a result, the pacing and storytellingis not as successful in balancing its various thematic elements, plots, characters and action sequences when compared to other similar MARVEL films like Captain America: Civil War (2016) or Avengers: Age of Ultron (2015). A prime example of this is Jennifer Lawrence as the blue-skinned-shape-shifting-mutant Raven/Mystique who gets a bit lost in the shuffle as the film unfolds and who feels a little unnecessary at times. Since the film comes off as uneven in patches and tends to favour action and special effects over narrative it may take some effort for audiences to peel away all the punches and explosions to find the film’s central story: fatherhood and the importance of who that father is. While the film definitively rules out the possibility of the false god Apocalypse making a good father, the film is rather silent when it comes to the Fatherhood of God as found in the Bible. Unlike other X-Men films, which preferred the idea that family is what you make of it, in X-Men:Apocalypse the nuclear family is portrayed positively as is the desire to have a real relationship between a father and his natural children. Perhapes the most compelling key to unlocking this aspect of the film is found in the character of Magneto and his son Quicksilver—a relationship that could whet the appetite of audiences toward more X-Men films.